The orientation of brand management has gone through substantial changes over the last decades, and has evolved as a more integrated and visible part of the overall corporate strategy. The evolution of the brand equity concept during the 1990s, development of advanced financial brand valuation methods and its adoption by advisors and their clients, and emergence of better brand tracking tools, have all facilitated the elevation of the branding discipline beyond the middle management and into the boardroom. The Asian boardrooms generally lag behind this trend and tend to manage brand marketing from a bottom-up perspective instead of top-down perspective. There are a couple of reasons for this. As marketing and brand decisions traditionally have been managed in mid-level marketing departments among most Asian companies, a large emphasis have been placed on tactical marketing activities as opposed to strategic branding approaches led by corporate management. Branding has been widely perceived as advertising and promotions. But several indications show rapid progression in the right direction for a selection of Asian companies where branding as a strategic tool has become more recognized and accepted within their boardrooms. This is also driven by the increasing attention on branding and its value-driving capability among stakeholders, media and opinion makers across Asia. 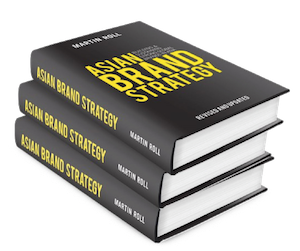 To achieve these objectives successfully, Asian companies must follow a comprehensive brand strategy framework supported by a systematic process throughout the organization. There are 10 crucial steps to follow in order to build a successful branding strategy and manage its implementation. The steps enable the Asian boardroom to focus its attention on the required areas, and serve as check-points which can be tailored to the individual company’s specific needs and requirements. The starting point for branding must be the board room, which also serves as the most important check-point during the project. The CEO must be personally involved in the brand strategy work, and he/she must be passionate and fully buy into the idea of branding. To ensure success despite the daily and stressful routine with many duties at the same time, the CEO must be backed by a strong brand management team of senior contributors, who can facilitate a continuous development and integration of the new strategy. All companies have their own specific requirements, own sets of business values and a unique way of doing things. Therefore, even the best and most comprehensive branding models have to be tailored to these needs and requirements. Often, only a few but important adjustments are needed to align them with other similar business models and strategies in the company to create a simplified toolbox. Remember that branding is the face of a business strategy so these two areas must go hand in hand. Who knows more about your company than the customers, the employees and many other stakeholders? This is common sense, but many companies forget these simple and easily accessible sources of valuable information for the branding strategy. A simple rule is to use 5% of the marketing budget on research and at least obtain a fair picture of the current business landscape including the current brand image among stakeholders, brand positioning and also any critical paths ahead. Simply do not forget the valuable voice of your customers in this process. Modern technology should play a part of a successful branding strategy. Technology helps to gain effectiveness and improve the competitive edge of the corporation. A well-designed and fully updated Intranet is a must in today’s working environment which has become increasingly virtual with employees working from home, from other locations and traveling across the globe to name only a few factors. An Extranet can facilitate a more seamless integration with strategic partners, suppliers and customers, avoid time consuming paper work and manual handling of many issues. A company website is not only a must, but rather a crucial channel for any modern corporation regardless of size. If the corporation is not accessible on the Internet today, it does not exist! The most important asset in a corporation is its people. They interact every day with colleagues, customers, suppliers, competitors and industry experts to name a few. But they also interact with an impressive number of people totally disconnected to the corporation in form of family members, friends, former colleagues and many others. Hence they serve as a corporations’ most important brand ambassadors as the word-of-mouth can be extremely valuable and have great impact on the overall image of the brand. The most effective way to turn employees into brand ambassadors is to train everyone adequately in the brand strategy (vision, values and personality etc.) and making sure they fully understand – and believe! – what exactly the corporation aims at being in the minds of its customers and stakeholders. Nike is a brand which is known for their efforts into educating and empowering everyone employed by the company to be strong brand ambassadors. The brand is the face of the business strategy and basically it promises what all stakeholders should expect from the corporation. Therefore, the delivery of the right products and services with all the implications this entail should be carefully scrutinized and evaluated on performance. Think of the cradle to grave concept of a lifelong customer and the value he/she will provide in such a time span. Make sure he/she is handled with outstanding care according to internal specifications and external expectations. The moment of truth is when the brand promise is delivered well – and it does not hurt if the corporation exceeds the customer expectation. Singapore Airlines runs a very rigid, detailed and in-depth description of any customer touch points with the corporation, and several resources are spend on making sure it actually does happen every time to every customer. All employees regardless of title and rank from Singapore Airlines spend a not insignificant amount of workdays being trained every year. Bring the brand to life through a range of well-planned, well-executed marketing activities, and make sure the overall messages are consistent, clear and relevant to the target audiences. Make sure the various messages are concise and easy to comprehend. Do not try to communicate every single point from the branding strategy. Instead, a selective approach will make much more impact using the same resources. The business landscape is changing almost every day in every industry. Hence the corporation needs to evaluate and possibly adjust the branding strategy on a regular basis. Obviously, a brand should stay relevant, differentiated and consistent throughout time, so it is a crucial balance. The basic parts of the branding strategy like vision, identity, personality and values are not to be changed often as they are the basic components. The changes are rather small and involve the thousands of daily actions and interpersonal behaviors, which the corporations employ as part of the brand marketing efforts. But it is vital to make sure complacency does not take root in the organization and affects the goal setting. The strong brands are the ones which are driven forward by owners whom never get tired of raising their own bars. They become their own change agents – and brand champions for great brands. Martin Roll Featured In The Abacus Magazine: Get On With It, Build Your Brands!